Whether you are an experienced player or someone who has never played before, Racquet Club members will make it easy and fun to get started playing tennis at Pine Mountain Lake. From tournament players to beginners, everyone is welcome. Weather permitting, drop-in Tennis is on Saturday on courts 3 & 4 starting at 8 AM in summer months ad 10 AM in winter months. No advance scheduling is required. This is a great way to meet members! Visit the Pine Mountain Lake Tennis page on Facebook to get updated information on Tennis socials, tournaments, and events. Email: pmlracquet@gmail.com for questions and information. For advance reservations call PML Department of Safety (209) 962-8615, 24 hours a day, seven days a week. Reservations may be made up to seven days in advance but cannot be made on the day of play (you must sign-in at the courts). Reservations and sign-ups are limited to one hour for singles, two hours for doubles, per day. Sign-up sheets will be posted daily at each court location and will show reserved time. All players must be listed on the sign-up sheet before play begins. Reservations will be forfeited if players are more than ten minutes late. A valid tennis pass is required to play. Annual tennis passes are sold at the Association Office. Daily and monthly passes are sold at the Main Gate Department of Safety. Non-marking tennis shoes only. Appropriate tennis attire - no swimsuits or jeans. No food or drink other than water on the courts. No glass containers. * Please See Tennis Policy for Definitions. Property owners may invite guests to play at property owner rates. Property owner must make the reservation for their guests either in person or over the phone with a PMLA PIN number in order to obtain this rate for their guest. Pickle ball is the fastest growing new sport in America today. 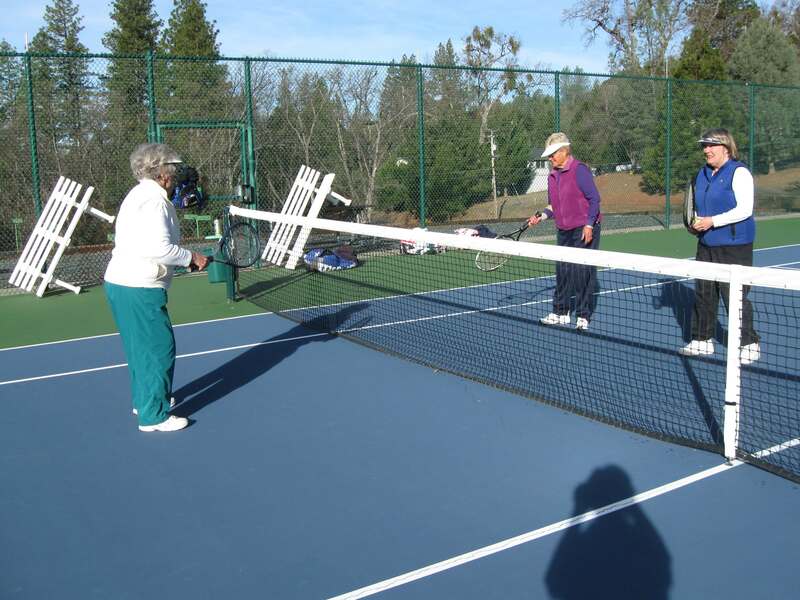 Pine Mountain Lake has six pickleball courts available at the tennis courts on Mueller Drive. Night play under lights is permitted until 10 p.m. when the lights go off automatically. Free lessons and equipment are available every Saturday from 9 - 11 am. For more information please contact us at pmlpickleball@gmail.com call Elisa Hoppner at 962-2002 or click on the Meetup link which will take you to our "Meetup Page". On this page you will find all the information about this new and fun sport right here at Pine Mountain Lake.